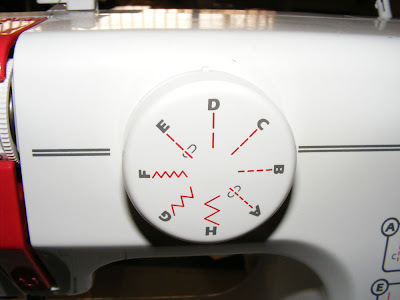 Question: What sewing machine do you use? Question: What tension do you set your machine on? What do I do if my tension leaves my stitches loose? Answer: I never set my tension. It came set "around" 3 and I have never touched it. I am afraid to. It has always worked for me. Once, I had a problem with loose stitches, but I had just changed my bobbin. I took the bobbin out, switched it around and my stitches were fine. Not sure what that all about, but check your bobbin if you are having problems. ALSO, use ONLY Janome bobbins. I think I read that in the manual somewhere. Question: What stitches do you usually use? 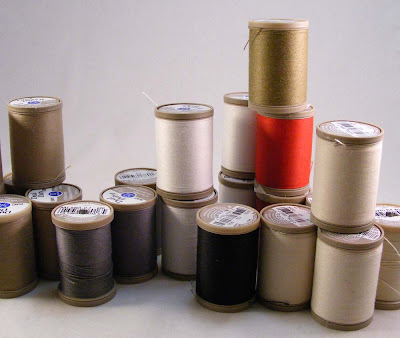 Question: What kind of thread do you use? 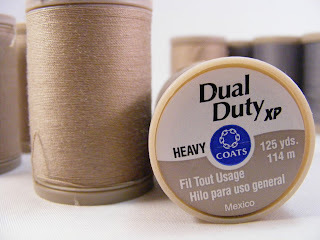 Answer: I use Coats & Clark Dual Duty XP Heavy thread. 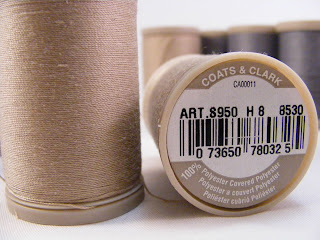 It comes on spools of 125 yards (114 m.) and is 100% Polyester covered Polyester (whatever that means LOL). 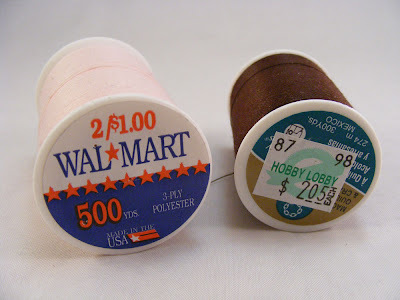 After I got my sewing machine, I went out and bought a bunch of different colored threads from Walmart and used that until I came across the thread mentioned above. I was looking for a different color at Hobby Lobby and came across this thread. It looked SO thick and rich and I HAD to get it. While I was satisfied before, I didn't know this thread existed. It looks way different on my cards than the cheaper stuff. Sometimes with thinner thread, you can actually see the bobbin thread hooking into the top thread on the surface of your card. I didn't like that. While the actual difference in thickness can't be THAT substantial... it sure seems like it when I am using it. One negative about using the thicker thread is, it seems to pull at my card stock a bit when I am stitching. 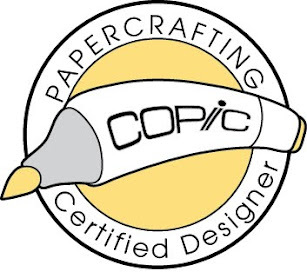 You need to keep your hands on the card stock and gently guide it as it goes along. With the thinner thread, I didn't have to be as diligent about guiding the paper. I will liken it to pulling a piece of fishing line and then pulling a length of chain. It definitely has a different feel. LOL That being said, I now ONLY use the C & C Heavy thread. 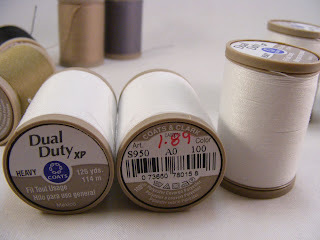 Number of total spools I'll have once my order arrives from Joanns.com: 36 (18 of which are white). Excessive? Maybe... but, I LOVE it and that makes it ok. LOL How long will it last? Not long enough I am sure. LOL I like to be WELL STOCKED! Please note that the price of this thread is pretty excessive when compared to other threads available. For me, the added cost is worth it and $1.89 per spool won't break the bank. Zig Zag stitching in a straight line and how to make the front of your card look nice and neat with NO stray threads! I don't mean to be a downer, but I HAD to comment. 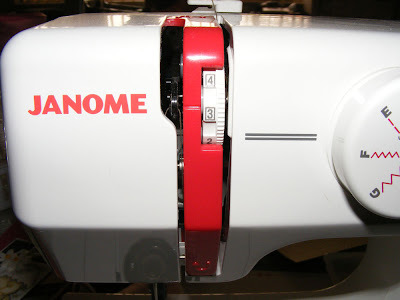 I purchased the Janome after reading on your blog about it around a year ago when my other machine broke. I HATED it. I'm not sure about yours, but mine had NO light source. Difficult for older eyes and I'm not that old. Mine also would spontaneously sew "upside down" then magically correct itself. I can't tell you how many cards I ruined with this machine. I love your advice Jodi and most everything you have ever said I find most helpful. This machine, however, was a constant source of frustration for me. I was able to purchase a refurbished Brother machine on Overstock for even cheaper than my Janome and it works sooo much better. I just had to share. Maybe I had a lemon, but even so I think the fact that there is no light to see what you are doing is worth mentioning. One more thing.... I am also so happy that I found a wonderful replacement for my SU dimensionals sold by YOU! Do 2 positives counteract a negative??? No worries, Nikki. :) This machine is not for everyone. I did mention the lack of light in an earlier post. I stand by my love of this machine, but I am sure I would be happy with another one too. I have had a really strong experience with mine, but I do know some of my friends have also not loved their machine. Thanks for sharing your experience! I think everyone should make an informed decision. Of course, I am not paid or compensated by Janome, so I am not "attached". LOL Have a great day! O.k. your timing is amazing - because I just walked in the door from buying thread! Seriously! But I think I bought too heavy. I'll let you know how it goes! Oh and btw, you ROCK! *is jealous* My machine is a lemon too but it worked great for awhile. I should try your thread and see if it makes a difference. 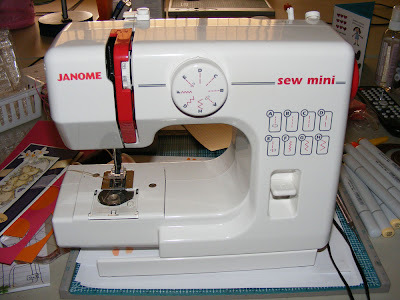 I have a Janome, too, but not the mini. 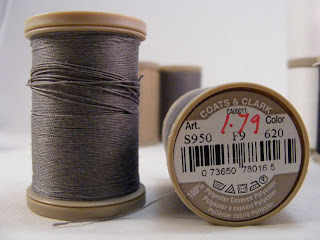 I was wondering which needle you use with the heavier thread. I don't like the look of the thinner thread on cards either - your cards always look wonderful! This is so funny. I just e-mailed Gina K. this afternoon about her machine and Where to find it. 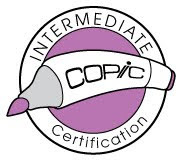 Your information couldnn't have come at a better time. Thank you. Also thanks for the added advice on threads. Saving for if/when I get brave enough to try it...if I stay with this stuff!!!! Fab info, Jody! Thanks for sharing! Now if only I could get a Janome mini in Canada, I'd be set! LOL! Next time I holiday in the States, I'm going to plan ahead and have it shipped to where I'm staying! haha! You know I love your cards!!! 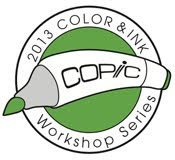 Great information, I used mine tonight with the settings you suggested and it worked like a charm. I'm thinking I was using one of the settings that may have been too tight, although my tension was set at 3, I used one of the other ones. Thanks for the thread information as well! 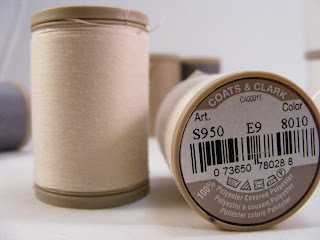 I just bought some of that thread and will be trying it out, the one question I had for you is do you use it on the bobbin as well or just for your top threading? I love that thread too! I have found that my machine does not like the "cheap" thread. It kills me to pay a little more but it is SO worth it not to have it break or jam-up during sewing! Thank you for the detailed information on the thread you use! It really does stand out in a GREAT way on your cards. 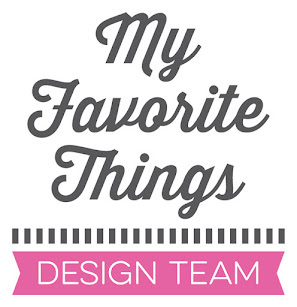 Tammy Hershberger turned me onto your post and I will definitely be on the hunt for this thread...and back later to read the other tutorials you linked to. 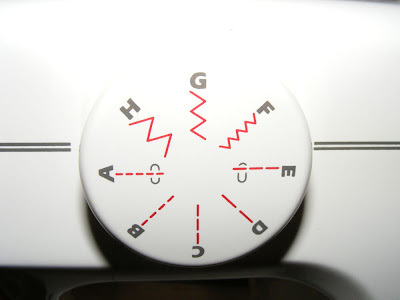 I received a brand new sewing machine last Christmas that I have YET to touch! I also have no clue how to use it, but I'm determined to figure it out before this Christmas!